A colleague of mine was recently in a Spanish restaurant where she was presented with a simple wine list, about 10 whites and 10 reds, but not one wine was recognizable. Everything was lowercase print and it was not clear what was the grape or the region or the producer… Confusing to say the least. And while a lovely wine steward helped her select a nice wine to try, that kind of menu can be frustrating, even with only 20 wines. To help on that end, here is a quick cheat sheet on grapes & regions from Spain and Italy (since these are often the ones that have the more confusing indigenous grape varieties to stump us). A region in northwest Spain, Rueda produces white wines made from the Verdejo grape, occasionally with some Sauvignon Blanc blended in. Crisp, dry, refreshing, with an almost herbaceous character. Good citrus and mineral aromas and flavors. If you like Sauvignon Blanc and Pinot Grigio, you will probably enjoy Rueda. A grape from the Galacia region of Spain – Rias Baixas to be exact. Makes a delicious aromatic wine, with floral and tropical fruit notes. Very crisp acidity balances this wine out – a perfect match for seafood. A white grape grown in Southern Italy. Apple and bananas. Not really taste like that, but can have great tropical fruit aromas and flavors, but not too heavy. A good medium-body wine. A grape from Piedmont region of Italy. Floral and nutty, with stone fruits like apples and pears as well. Crisp, medium-bodied. This is a very cool variety and goes with lots of foods. A red grape from Spain, also known as Mourvedre in France and most other wine-producing regions. Monestrell wines usually come from Jumilla, Yecla or other regions in Spain. Very concentrated and intense, Priorat can have structured tannins with concentrated fruit. Some bottles are collectibles and age-worthy. Barbera is a grape that actually makes it onto the label of the wine. Barbera d’Asti or Barbera d’Alba are the most popular. Barbera is a light bodied grape with lots of great fruit and acid – excellent food wine! Think pasta with red sauce. It’s Zinfandel! Same grape DNA, but different name when it comes from Italy. Also has a different flavor profile. Primitivo is not as concentrated and dense as some California Zinfandel. More rustic spice going on. But great fruit as well. Lots of ripe fruit and easy drinking. These are very approachable wines. Montepulciano is the REGION here and the grape is Sangiovese, which is the noble grape (vino nobile) of the region. Similar to Chianti. Sangiovese-based Tuscan red with good acid, cherry fruits and dusty tannins. We’ll follow up to this segment next month so let us know what other grapes and regions cause confusion! Chances are, the wine you drank last night had a "contains sulfites" advisory on the label. Ominous as that may sound, sulfites are a terribly misunderstood component of wine. We’ve set out to demystify a few sulfite myths here. – First let me say that just as some people are lactose intolerant or allergic to pollen, there are people who are sensitive to sulfites, even the small amounts in wine (which contains about 10mg/glass; 80mg/liter), and this sensitivity can cause a reaction. Asthmatics can be particularly sensitive. This small percentage of the population must also avoid other sulfite- heavy products such as dried fruits and molasses. If you think you're sensitive to sulfites, try eating a handful of dried apricots and see how that affects you – dried fruits, particularly apricots, have about 10 times more sulfites added than your regular glass of wine. – Sulfites are not the cause of the mysterious red wine headache. Some drinkers do get a headache from red wines, but studies have not yet been able to find the exact culprit there, though histamines are thought to have some effect. White wines often have more sulfites than reds, so if no headache is caused by whites, but you do get them with reds, its not the sulfites. – Almost ALL wines contain some percentage of sulfites. Yeasts naturally create sulfites in wine during fermentation, so if your wine was fermented, then its got some sulfites hanging around. What the USDA’s advisory label primarily refers to are added sulfites. – Sulfites are added to wine as a preservative since wine is a perishable substance. They are not dangerous. They have been a part of winemaking for centuries, though in different forms. They kill bacteria in wine, which we certainly don’t want, and they protect the wine from oxygen, which can turn a wine to vinegar pretty fast. – Almost all winemakers add some sulfites to their wines. Again, winemakers want to preserve their wine, and sulfites are the safest way to do it. You can find wine with no added sulfites, which can be stated on the label. These are the only wines can be certified organic by the USDA. There are other organic certification programs that do allow minimal sulfites to be added. – There is no difference in the French or Italian wine you drink here vs. the one you drank in the home country. Winemakers do not add more sulfites in wines coming to the US than they do to wines that remain local. Most other countries do not require a sulfite warning on the label, so you will only see the warning on wines purchased in the US. But again, that does not mean that a Bordeaux here in the US has more sulfites than the Bordeaux sold in Bordeaux. Just the labeling laws differ. So, those are some notes on sulfites. A great article to read on sulfites and wine is here, done by researchers at UC Davis. Lately I’ve been craving Syrah for two simple reasons: It pairs well with hearty meals and, best of all, it costs much less than other popular varietals. With so many options for wine lovers out there, one question I get from time to time is, 'what is the difference between Syrah and Shiraz?' Answer – Nothing! In the true spirit of Australian individualism, the Aussies planted Syrah and called it Shiraz. The two grapes are genetically identical, though in taste profile, you will find some differences. Since Roman times Syrah has been grown in the a Rhône region of France. Hence, it is commonly referred to as a Rhône varietal. Syrah has seen a surge in popularity and is now grown in California, Washington, South America and South Africa. You can find it in just about every region, though those listed are most popular. Despite these new challengers, I prefer Australian and French Rhône wines. Syrah from these regions offer intense richness and a full-body. French Syrah comes from the Rhone Valley, which is divided into the Northern and Southern Rhône. Northern Rhône wines command a high price and produce some of the most sought after and long-lived Rhône wines. Northern Rhône wines are made primarily from Syrah, though in some areas a small percentage of white can be blended in. Familiar appellations in the Northern Rhône include: Côte Rotie, Saint-Joseph, Crozes-Hermitage, Hermitage and Cornas. The Southern Rhône produces much more accessible wines in that they are priced affordably and made for much earlier consumption than Northern Rhône wines, which can take decades to mellow. The freshness of Southern Rhône wines is a result of blending Grenache with Syrah, as well as a myriad of other grapes, including Carignan, Cinsault and Mourvedre. In fact, Grenache is considered the dominant grape in the Southern Rhône and Syrah is often added to beef up the blend with powerful tannins and flavor (a practice also followed in Australia). Familiar appellations include: Gigondas, Vacqueyras, Côtes du Rhône and Chateauneuf-du-Pape. Northern Rhône Syrah offers leather and spicy black pepper qualities coupled with intense tannins and a higher natural acidity than its Shiraz brother. Complex flavors lead to a long wonderful finish worthy of contemplation. Southern Rhone wines, having a smaller percentage of Syrah and different growing conditions, are much softer, though still providing some spicy, earthy notes. Australian wines are booming and winemakers have made huge strides understanding which varietals grow best in each region. Australian Shiraz is planted in several areas, but the best come from the Barossa, McLaren Vale and Coonwarra (also noted for its Cabernet Sauvignon). These areas experience high temperatures resulting in very ripe fruit with lower acidity. The ripe fruit coupled with Australian winemaking techniques create luscious, silky, mouth-filling wines. The Barossa Valley in particular excels in the Aussie style offering round tannins and dark fruit flavors, accented with chocolate notes. Thirsty yet? Delas St. Esprit Côtes-du-Rhône Rouge 2007 ($9.99). Contains soft tannins with smoky aromas of black pepper and burnt brown sugar. Pair with roast chicken. A steal at $9.99! Tait The Ball Buster 2007. Luscious dark fruit with cocoa nuances. Pair with steak or roasted lamb. You may have seen huge bottles in restaurants and wine stores and thought ‘There’s got to be a name for those bottles, other than Really Big Bottles.’ And there are. Pretty cool names, too. A few numbers: A standard bottle holds 750mL and is the most common bottle size you will see. After the magnum, the names of bottle sizes come from the names of kings noted in the Old Testament. Bottle – 3 liters/4 bottles in Champagne & Burgundy (as well as most New World). In Bordeaux this size is called a Double Magnum. King – After the death of Solomon, Jeroboam led a revolt against Rehoboam and became King of a newly independent kingdom of Israel. Bottle – 4.5 liters/6 bottles (in Bordeaux this size is called a Jeroboam, just to confuse you). King – King of Judea after the death of his father, Solomon. Bottle – 6 liters/8 bottles (in Bordeaux this size is called Imperiale). King – Here is an exception, as Methuselah is not a king, but rather the oldest man cited in the Bible at 969 years old. King – King of Assyria, also known as Shalmaneser. Mentioned in 2 Kings, Chapter 17. King – In the Book of Daniel, King Belshazzar (or Balthazar) was the last king of Babylon. 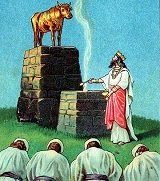 King – King of Babylon (before Balthazar) who conquered and exiled many Jews. Also built the “Hanging Gardens of Babylon). Seen here in painting by William Blake. There are larger bottles said to be out there – Melchior for 24 bottles and Sovereign for 34 bottles. These are very rare. The largest wine bottle made so far was commissioned by Morton’s Steakhouse in 2004. At 4.5 feet tall, the bottle held 130 liters (173 bottles, 1200 glasses) of wine. The wine itself was Beringer Vineyards 2001 Napa Valley Cabernet Sauvignon Reserve. What’s the biggest bottle you’ve drunk?